As with the Living Cirripedia, there is no indication on the title pages that the two volumes are parts of the same work, but the preface to Volume II states that this completes the work. In a circular to members of the Palæontographical Society, dated June 1863, the Secretary, Thomas Wiltshire, gives 'the dates of the years for which the volume containing the Monograph was issued' as 1851, 1854, 1858a (the 'a' refers to a footnote which states that the index came out in that year); he also gives 'the dates of the years in which the Monograph was published' as 1851, 1855, 1861. What Wiltshire meant was that the complete volumes 5, 8 and 12, were published in those years. Each of the two parts contains its own index; that for the first part was issued with it; that for the second was apparently forgotten and this omission was not set right until the issue of a single leaf in 1858. The Geological Society of London holds a set bound up as issued and this single leaf occurs in its correct place. 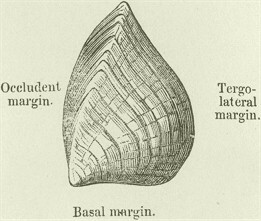 Darwin had assisted John Morris with the cirripedes in the second edition of his A catalogue of British fossils, 1854. On page 97 of this work, the author writes 'Mr. Darwin has kindly supplied the following references to the above species which will be figured in his forthcoming Memoir on the fossil Balanidae'. He then refers to fifteen plates and to the figures given in each, whereas Darwin's work has only two plates. In fact, the first six species named occur in the first plate, the seventh, Balanus tulipa in both plates, and the rest in the second. The species given by Morris as B. tulipa O. F. Müller 1776 eventually appeared in Darwin's work as B. hameri Ascanius 1767. A complete set of the Palæontographical Society's monograph volumes appeared in facsimile in 1966, but Darwin's work was not available alone. See also Darwin's Study of the Cirripedia by Marsha Richmond & Newman, W. A. Dates of publication of two of Darwin’s volumes on the Cirripedia (barnacles).